Video content is playing an increasingly important role in demand generation as well as customer lifecycle engagement for Cochlear, as the group seeks to improve the lives of the hearing impaired globally. According to Cochlear Asia-Pacific president, Anthony Bishop, Australia is the most highly penetrated market in the world, yet fewer than 10 per cent of prospective candidates are recipients of a hearing implant. Video content has become a primary way Cochlear is engaging prospects not just in Australia, but across Asia-Pacific and globally. While video is playing a key role in acquisition, it’s also vital in ongoing engagement with those that have received a Cochlear implant. Bishop described the organisation’s overarching customer model as ‘growing the core’, then providing a services business to recipients. Given Cochlear’s local, regional and global marketing remit, sourcing video content for multiple locations, demographics and channels was historically a challenge. Quick, on-the-ground production capability, along with content consistency and quality, were both difficult. “We’d end up either sourcing a crew from Australia, which is expensive, or getting a crew locally, where quality can be hit and miss,” Bishop said. 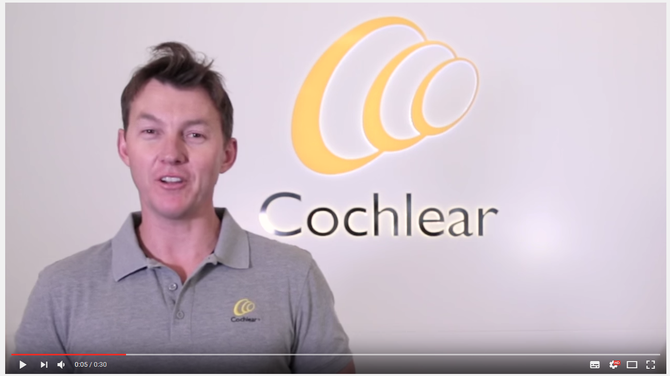 To overcome these issues, Cochlear struck up a partnership with cloud-based video production platform and marketplace, 90 Seconds. This has enabled the organisation to triple video production across the region and shoot across all countries in Asia-Pacific for up to 40 per cent less cost. Using the 90 Seconds platform, the Australian marketing team can also manage projects and edit everything centrally. Bishop said the team produced 36 pieces of video content in the last 12 months for the region in collaboration with 90 Seconds, as well as lots of repurposed content. This includes short social media videos, which are increasingly used on Facebook to drive demand, plus its Cochlear TV Web services, aimed at existing customers that launched in January and chalked up 18,000 views with its first two 10-minute episodes. Many of the videos feature former Australian cricketer, Brett Lee, Cochlear’s hearing ambassador and face of the #soundsofcricket campaign. The Cochlear TV program, meanwhile, is hosted by an implant recipient. More widely, Cochlear’s customer lifecycle strategy has led to the opt-in Cochlear Family initiative, aimed at giving customers insights on the latest updates as well as support services that help them get the most out of the hearing experience. Meanwhile, as part of the nurturing process, Bishop said it’s launched a concierge service to connect those looking to receive an implant to appropriate surgeon, providers and supporters. The marketing team is also increasingly becoming more sophisticated around how it identifies those on the hearing loss journey by using personas, mosaics and targeted communications. To help, it’s worked with Experian to map recipients of Cochlear implants, an exercise that’s assisted the team in identifying geographic gaps where it doesn’t have as great a presence. “We just need to keep experimenting and learning,” Bishop continued. “We all know that if you get an email from a supplier that meets your needs at the right time, you’re more willing to look at it. Over the next 12-18 months, Cochlear is launching a number of new technologies and Bishop said a number of campaigns for both prospective candidates as well as recipients are being crafted. But while marketing spend today is heading down the digital route, and split about 50/50 between online and offline, Bishop said there is still big opportunity to do trade forums and meetings, particularly in rural areas. “Regardless of what we do, once someone is interested in an implant and we help funnel them to a surgeon and audiology team to treat them, they all talk to another Cochlear implantee. So it’s still a high-touch space,” he concluded.